Looking for a yummy baby shower punch recipe? We're here to help! Sure, you have the perfect cake, and you're already stocked up with supplies, but don't forget the punch! We've put together some great baby shower punch recipes, so the only problem you'll have is which one to pick! 1 64fl. oz can of Hawaiian Blue or Pink Punch depending on the preferred color. 2 pkgs of blueberry lemonade or blueberry punch Kool-aid for a boy or pink punch or pink lemonade for a girl. Mix sugar with water, Kool-aid, punch, and ginger-ale or 7-up. Keep the mixture chilled until right before serving, then add ice cream or sherbet. Chill all ingredients before mixing in a punch bowl. Mix the fruit drinks first, then add the sparkling water or champagne to taste. Combine the sherbert and fruit punch in punch bowl. Add more of both as needed. Add sherbet to punch bowl and then ginger ale to taste. Make a syrup with sugar and heated water, and let the syrup cool. Combine the syrup with the grapefruit juice and grape juice, and pour over ice. Add the Sprite or 7-Up just before serving. This punch is clear, but colored juice can be substituted or food coloring added. 2 packages of Kool-Aid (Cherry or strawberry flavor works best). Mix all of the ingredients, except the ginger-ale, which should be added just before serving. 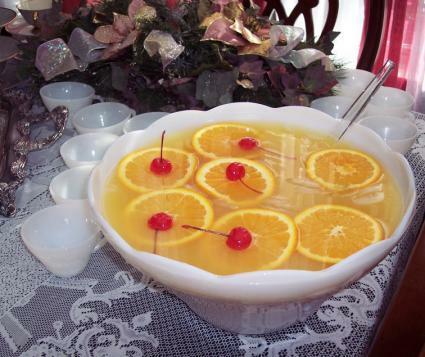 For an elegant addition, add an ice ring out of cherries, oranges, or lemons. Dissolve Jello in 1 quart hot water, add sugar, and stir. Next, add juices and lemon juice. Add water to a gallon jug. Add a fruit ice ring for a delicious touch. 4 liters of Sprite or favorite lemon-lime drink. Take a half gallon of sherbet and place it in the punch bowl. Add a 2 liter of Sprite to the punch bowl. Add additional Sprite and Sherbet when needed. Mix 6oz of grenadine with 2 liter of soda, and add cherries. Mix the gelatin with heated spring water. Refrigerate the mixture until firm. Blend the frozen concentrates until smooth, and add the gelatin. Add crushed ice, and mix well. Serve immediately. Don't forget to check out all of our other great recipes at LoveToKnowRecipes. Know some more great punch recipes? We'd love to see them! Be sure and add your favorite baby shower punch recipes!